From the breaking my balls department... Nosaj Thing @ Aces Lounge tomorrow night, July 15th! 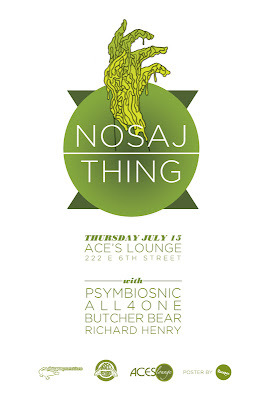 Los Angeles producer Nosaj Thing crafts stately, ethereal synth-based instrumental hip-hop, with influences that range from Boards of Canada and DJ Shadow to Danny Elfman and Erik Satie. An L.A. native, Jason Chung was inspired at an early age by the hip-hop radio stations that the bus driver would play on his way to elementary school, and particularly by the Beat Junkies' turntablism on Power 106. In high school, while delving into the sounds of drum'n'bass and the rave scene and playing quad toms in the school drum line, he figured out how to use his father's old PC to start programming beats of his own. Further along, Chung was motivated to move in more experimental directions by the D.I.Y. rock scene at L.A.'s underground venue ~The Smell, where he made his live debut as Nosaj Thing in 2004. Through online and in-person networking, on message boards and, eventually, at the more beat-oriented music spot ~Low End Theory, Chung came into contact with likeminded Angelenos including Flying Lotus, Nobody, Daedelus, and local legends (and personal heroes) like D-Styles and Daddy Kev. Following the self-released Views/Octopus EP in 2006 (whose track "Aquarium" was later used by rapper Kid Cudi as the basis of his "Man on the Moon"), he signed with Kev's Alpha Pup imprint for his full-length debut, Drift, in 2009. Chung has also contributed beats to MCs Busdriver and Nocando, and made remixes for Flying Lotus, Daedelus, Radiohead, and ~Smell staples Health.